Meet Spike and Slam—the nasty duo that engineers those wild stock market gyrations that drive most investors—but not you—right out of their ticker. You always suspected that there were gremlins engineering those drastic downdrafts and meteoric rises on Wall Street. In fact, you are right. The pitiful pair is Spike and Slam. Spike specializes in rallies, while Slam focuses on routs. Spike pumps things up, Slam lets the air out. They’re an impatient pair—they delight in big, fast moves …up, up, up, then down, down, down. Then up, down, up, down, down, down, up, up, up followed by more down. Balance, rationality, reason? If you think there’s any place for clarity, wisdom and thoughtfulness in this tandem’s grim game, then it’s apparent you don’t understand Spike and Slam. Panic, euphoria, depression—they’re the kind of emotions that Spike and Slam thrive on. Rule 1. Be patient. Do what so few investors are able to do: understand that success is a matter of steady progress over time. No one, it seems, can stand to wait and let things unfold. The other little problem that goes hand-in-hand with this one: short-term memory. Spike and Slam are masters of investor amnesia. By contrast, successful investors position themselves to benefit from major economic trends and business themes, even though it may take many years for them to play out. Rule 2. Recognize that volatility is increasing. Today, there are a number of factors playing right into Spike and Slam’s hands. Media coverage of financial markets has exploded and, in order to fill time and space, details and minutiae are treated as earth-shattering news. Day traders, although severely chastened, still follow the siren song of a quick dollar. Every day, Wall Street analysts send up such a cacophony of ratings—“buy,” “strong buy,” “hold,” “accumulate”—that it’s impossible to know what to listen to and what to ignore. And, the Security and Exchange Commission’s Regulation FD (for “Fair Disclosure”) means companies must announce news—good or bad—to everyone, equally at the same time, leading to knee-jerk reaction at the expense of genuine analysis. Computer trading can move shares violently based on mathematical formulas, not an investment strategy. Rule 3. The fortunes of companies don’t change overnight. Sound, well managed companies with leading market shares and solid financials don’t suddenly turn sour—even if their share price occasionally causes investors to pucker. Sure, there are cycles; some years will be better than others. And, even good companies make mistakes. At McRae, we monitor these things all the time, but we don’t sell a great company just because Slam makes a big deal over an earnings shortfall of one penny. Rule 4. Even long-term winners experience periods when their prices decline. We focus on growing companies, but sometimes their share prices can get ahead of themselves and move up at a rate that is too fast to be sustained. To be successful long term, you have to wait through these periods, during which the share price adjusts to the true internal growth rate of the company. No one knows when these periods may occur, so at McRae we are patient, long-term investors. Rule 5. In bad times, good companies do better, but it takes a while for the stock to reflect this. As a general rule, good companies do better than weak ones when economic conditions slow. Buyers tend to stick with trusted brands, and stronger companies have the financial resources and superior management to weather the storm and come out even stronger. Rarely are things as good as they seem when markets rally, nor as desperate as they appear when markets trough. Rule 6. Inaction can be the most effective action of all. Spike and Slam don’t want us to tell you this, but the fact is that when the market is falling you sometimes simply have to take the pain. Good companies don’t become bad ones overnight (Rule 3), but that doesn’t mean that Spike and Slam won’t try to get you to think that there’s some kind of Jekyll and Hyde struggle going on that you aren’t aware of. Rule 7. Volatility is the reason for diversification. As a McRae client, you know all about diversification. There’s no antidote to volatility, but diversification is as close to a wonder drug as there is. Rule 8. The truth is usually somewhere in the middle. Rarely are things as good as they seem when markets rally, nor as desperate as they appear when markets trough. Spike fans the flames when markets rise, and Slam spreads the gloom when they fall. But, reality is usually somewhere in the middle. Wouldn’t it be nice if those sharp, jagged lines that make up charts tracing market performance were smooth and rounded instead? Rule 9. Big money is made over the long term. Unless you’re fortunate enough to win the lottery and win it big, you won’t accumulate substantial wealth quickly. You know that from your own experience. Successful people are successful because they’ve worked long and hard, stuck to their knitting and made careful, informed decisions along the way. Sounds like successful investing, doesn’t it? Rule 10. Distinguish between good volatility and bad volatility. Bad volatility—the kind all of us want to avoid—occurs when a stock loses value because of deteriorating fundamentals. If that is the reason for its decline, it’s better to sell and move on to something with better growth prospects. Good volatility comes in two flavors: As investors, we want markets to go up. If we’re smart, we’ll take advantage of appreciated stocks and sell from time to time in order to put the money to work in other areas that represent greater opportunity. When good companies get beaten down, we don’t despair— if the fundamentals are still strong, we hold or buy. Summary: Spike and Slam hate rules. They’re more into chaos. The weaker your investment discipline, the easier it is for them to perpetrate their mission of mayhem. Their closest ally is volatility and its impact on investors. Greed, fear and doubt create fertile ground for this terrible twosome. 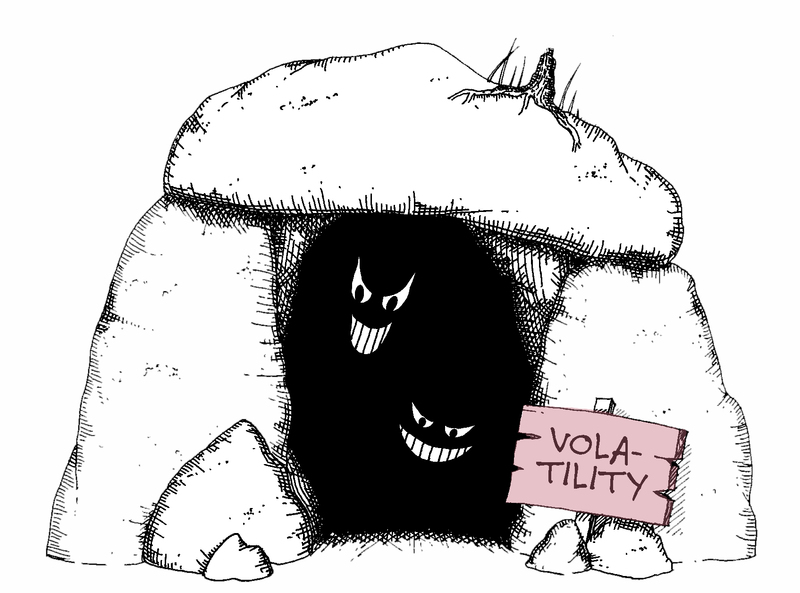 So, accept that volatility is a way of life and stick to the principles articulated in the 10 Rules. If you do, Spike and Slam will be exposed for the phonies they really are. As with market volatility, McRae Capital can help you understand a host of topics, like college planning, how to live off retirement savings, and why taking the long view as an investor is so very important.